COSTANOR S. XXI, S.L. also manufactures floating platforms or lines by making breakwaters and floating quays of reinforced concrete, either by using special formwork implemented on site or at its facilities in Viveiro (Lugo). The EHE specifications are taken into account for the construction thereof, using extreme measures to protect the steel framework against corrosion and by applying concrete surface treatments in order to adequately cure the same. This is the ideal protection for lakes or semi-sheltered docks. Breakwaters are the solution for creating shelters in areas where short waves are caused by wind or by the passing of other boats. Given that these are floating devices, the environmental and ecological impact thereof is minimal and therefore the procedures for obtaining permits and authorisations are much simpler. Width without defences: From 3.00m to 5.00m. Weight: According to the modulation. Steel reinforcement: B-500 SD hot-dip galvanised by immersion. NOTE: Special dimensions can be supplied at the request of the client. 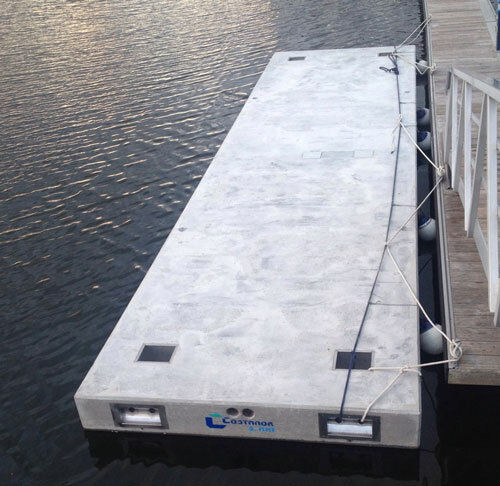 Consisting of concrete modules as construction elements lightened with polystyrene, providing stability and strength similar to fixed docks. These structures provide extraordinary strength against waves in semi-sheltered areas and are highly buoyant. The inertia of the same make them suitable for mooring medium-length boats, yachts, fishing boats, rescue boats, patrol boats, etc. They are available in beams from 2.50 m to 5 m and variable lengths from 10 m to 20 m depending on the beam and place of manufacture, transportation or other factors that may condition or alter the manufacturing of the product. The floating quays can also be connected in parallel in order to build platforms on which restaurants, stages, etc. may be positioned. The floating quay is manufactured in accordance with the EHE guidelines. Width without defences: From 2.50m to 5.00m. Height: 0.90m. up to 5m. Like the breakwaters modules and reinforced concrete floating quays, this system also has an inner core of high density expanded polystyrene. The floaters are placed under the marine structural aluminium frames lined with tropical wood treads, thus ensuring excellent stability of the floating quays for mooring the boats due to the great inertia which these provide to the whole assembly.